13.2% alc., $75. · Moderate reddish-purple color in the glass. Shy aromas of black cherries, rosebush and flint. Middleweight flavors of black cherries, black raspberries, cola and rose water, with a flowery undertone. Well-balanced ripe tannins and a focused, chalky finish leaving behind a lively fruit impression. Not the drive, extract and power we have come to expect from Shea Vineyard in this vintage, but still a wine of interest. Tasted the following day from a previously opened bottle, the nose was very perfumed and flowery with hints of oak and spice, the wine was smooth and soft on the palate, and some appealing spice had been added to the flavor profile. Very good. 12.6% alc., 519 cases, $38. A combination of new, once used and neutral barrels from all Pinot Noir sites. Some aspect of whole cluster and the result of sur lie aging. · Moderately light reddish-purple color in the glass. Very fragrant with scents of red cherries and wild strawberries. Fresh, bright and refreshingly juicy with flavors of red cherries, raspberries on the vine, watermelon, and toasty oak. Light and delicate, but charming with electric acidity. The best Willamette Valley bottling from Big Table Farm in a few years. Good (+). 12.6% alc.,$45. A collaboration with Don, Johanna, Lynne and Perry who farm this vineyard. · Moderately light reddish-purple color in the glass. The nose opens gradually, revealing aromas of dark cherries, violets, spice and brewed tea. Very satiny and seamless on the palate with a tasty core of fresh cherry fruit enhanced with accents of savory herbs. 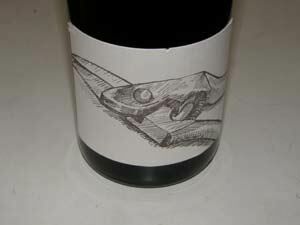 Modest weight, with very supple tannins, leaving behind a combination of cherries and green salad on the finish. I like this wine a lot for its easy manner. A very admirable effort in this difficult vintage. Very good. 14.9% alc., $36. · Medium reddish-purple color in the glass. This wine reflects the relatively warm 2009 vintage in the Willamette Valley. Aromas of black cherries, tomato and beet. Flavors of black plum, black cherry and raisin. 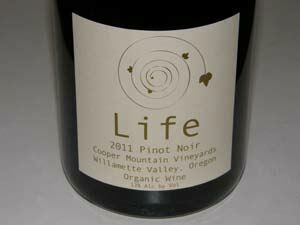 Plenty of concentration with balanced tannins, but lacks the verve that Oregon Pinot Noir is known for. Too ripe for my taste. Decent. 13.0% alc., 200 cases, $35. Aged in 30% new and 40% second-use French oak barrels. No sulfites added during winemaking. Certified organic by Oregon Tilth. Biodynamic® by Demeter®. This bottling began as an experiment in 2002, but has become very popular. Consumers are advised to drink this wine upon acquisition, although the winemaker believes it will hold up well for short-term aging. · Moderately light reddish-purple color in the glass. Very fruity nose featuring bright aromas of cherries, strawberries and red fruit punch. Flavorful and forward, offering tastes of dark red and blue berries, red plum and a complimentary savory herb note. The tannins are well managed and the acidity brings life to the fruit. An excellent food wine in a Beaujolais style. Good. 13.5% alc., $50, screwcap. Vineyard owned and farmed by Doug and Pat Marsh. Clone 115 and Pommard on Riparia rootstock, irrigated, planted in sedimentary sandstone, sustainably farmed. · Light garnet color in the glass. Aromatic, with clean scents of cherries, tea leaf and compost. Light in weight and easy to drink, but the flavors of woody cherry, red berry, black tea and green leaf don’t particularly appeal. Decent. 13.5% alc., $70, screwcap. From Wits’ End Vineyard. · Light garnet color in the glass. Shy, but pleasant aromas of dark cherries and berries. 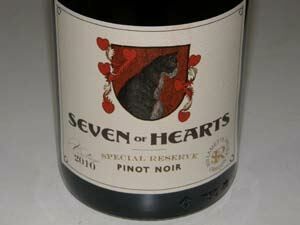 Delicious core of red fruits with accents of spice, sassafras, graham and nutty oak. Juicy, elegant and charming, displaying balanced fine-grain tannins and a short, but satisfying finish. Interesting textural magic. Noticeably lighter in this vintage. Very good. 13.5% alc.,112 cases, $42. A blend of several vineyards in the Yamhill-Carlton, Eola- Amity Hills and Chehalem Mountains AVAs. Volcanic and sedimentary soils. Clones 114, 115, 667, 777, Pommard, Wädenswil and Mariafeld. Aged in 27% new French oak barrels. · Moderately light reddish-purple color in the glass. Shy, but pleasant aromas of black cherry preserves and musk. Well-endowed with a core of delicious dark cherry and dark red raspberry flavor. Silky and seamless on the palate with restrained tannins and noticeable finishing power. The wine is slow to evolve in the glass and was considerably better the following day from a previously opened and re-corked bottle. Decant if you must drink now. Very good.